Arrive Johannesburg and After Clearing Customs and Immigration Proceed for a Johannesburg City Tour. We Visit the Gandhi Square Where Gandhiji Had His Office. We also Visit Nelson Mandela Square. Thereafter Proceed to Check in At Our Hotel. Dinner and Stay At Johannesburg. After Breakfast We Proceed Towards Sun City. Arrive Suncity and Check Into the Hotel. 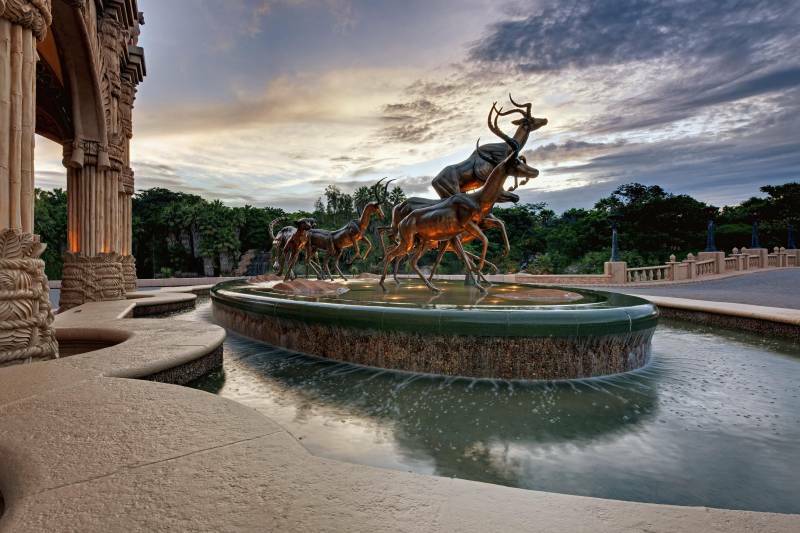 Sun City Offers a Myriad of Different Entertainment and Relaxation Opportunities, as Well as Enough Attractions and Activities to Keep Everyone Busy. You have An Option to Visit Bird Aviary or Enjoy Optional Activities like Quad Biking, Jet Ski, Parasailing, Motor Boats, Banana Ride Etc. Evening Return Back to the Hotel.stay At Suncity. Early Morning Check Out and Proceed to Johannesburg Airport to Board Flight for George. Arrive George Airport and Proceed to Mossel Bay. Arrive At Mossel Bay Check in At Our Hotel. We Then Proceed to Relax At the Natural Tidal Pool.in the Evening We Go for a Lighthouse Hike.dinner and Stay At Mossel Bay. After Breakfast Proceeds to Cango Caves, One of the World’s Great Wonders, to Experience the Fusion of Fantasy with Natural Beauty in the World’s Finest Stalactite Caves. Thereafter Proceed to Ostrich Farm to Avail the Ever Had Opportunity of Riding An Ostrich or Stand On Top of Ostrich Egg. Later On We Visit Cheetah Land and Crocodile Farm At Cango Wildlife Ranch. Dinner and Stay At Mossel Bay. After Breakfast You Get a Chance to Enjoy Optional Activities such as Helicopter Ride Giving Us the Breathtaking Views of the Wonderful Sea and More Than 60 Kilometers of Beaches, Quad Biking Adventure – Enjoy the Ride On a 4 Wheeled Bike Where You Can have An Experience of Lifetime and Speed Boat Ride. Dinner and Mossel Bay. After Breakfast We Proceed for a Day Excursion of Knysna, On the Way We Take Our Halt At Bloukrans Bridge Located in the Tsitsikama Region for Bungee Jumping (optional). Bloukrans Bridge is the Site of the World‘s Highest Commercial Bungee Jumping. Thereafter We Proceed to Take Our Halt At Knysna- is a Town in the Heart of South Africa’s Beautiful Garden Route Just East of Cape Town. Knysna Lies Nestled in Between the Outeniqua Mountains and the Indian Ocean. After a Brief Picture Halt We Precede Our Journey Crossing Some of the Beautiful Towns Falling By the Sea. Dinner and Stay At Mossel Bay. After Enjoying Your Breakfast We Check Out from the Hotel and Proceed Towards Cape Town. this is South Africa’s Most Beautiful City, Blessed with Good Climate, Natural Setting, and Well-developed Infrastructure. also Known as “the Mother City” It is the Second Most Populous City in South Africa After Johannesburg. We Arrive and Check in At Our Hotel. Then We Proceed to Canal Walk. Canal Walk is the Third Largest Shopping Complex in Africa. the Shopping Centre Hosts Over 400 Stores, 7000 Parking Bays, Numerous Restaurants, 20 Cinemas Plus a Game Arcade. Dinner and Stay At Cape Town. After Breakfast Drive to Cape Point. Visit “cape of Good Hope” with Flying Dutchman (south Western Point of the African Continent).on the Way Back Visit Seal Island. Evening We Proceed to V&a Waterfront. Dinner and Stay At Cape Town. After Enjoying Your Breakfast Proceed to Drive Up to the Cable Car Station, for a Cable Car Ride Up Table Mountain (if Weather Permits), South Africa’s Premiere Tourist Attraction. the Exhilarating Assent of Table Mountain Provides Breathtaking Views Over the City and Its Beaches. the Panorama Stretches from Table Bay to False Bay and Around the Mountain to the Hout Bay Valley. Later We Proceed for An Orientation City Tour Visiting Green Market Square, District 6, Company Gardens, Houses of Parliament, the Castle, Signal Hill, Sea Point, Water Front, Malay Quarters and Downtown Business District and Clifton On the Way to Hout Bay. Stay At Cape Town.